Disney launched their official 2015 preview yesterday, and if you missed it, Avengers: Age of Ultron was one of the centerpieces in their lineup. Included with the presentation was a brand new photo from the Marvel sequel, though it will be familiar to anyone who has seen the trailer. It features Robert Downey Jr. as Tony Stark in an early moment from the movie, as he throws a lavish soiree at the new Avengers Tower. The entire gang has arrived, and appeared to be having a good time. 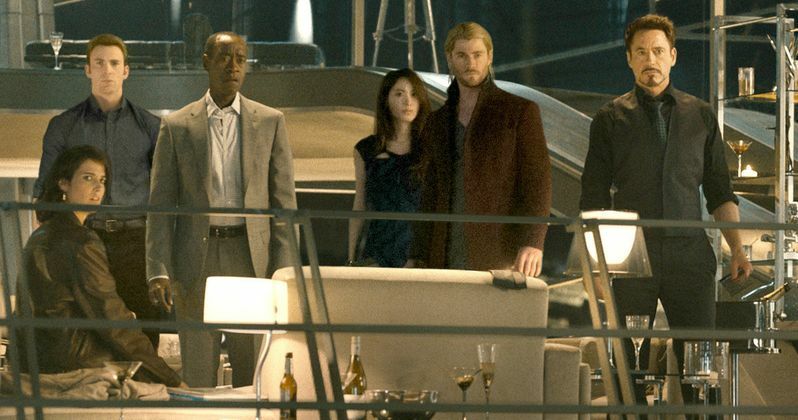 This is just seconds after Ultron crashes their party. Avengers: Age of Ultron finds Tony Stark trying to jumpstart a dormant peacekeeping program. Things soon go awry and Earth's Mightiest Heroes, including Iron Man, Captain America, Thor, The Incredible Hulk, Black Widow and Hawkeye, are put to the ultimate test as the fate of the planet hangs in the balance. As the villainous Ultron emerges, it is up to The Avengers to stop him from enacting his terrible plans, and soon uneasy alliances and unexpected action pave the way for an epic and unique global adventure. Official Avengers: Age of Ultron promo art has also debuted on line. These latest images feature a few key Ultron shots, along with another look at Hulk fighting the Hulkbuster. We get to see most of the main heroes assembled, and there is a nice shot of Thor standing alone as one of the more underrated members of his team. Check it all out, and then anxiously await this sequel that is only a few short months away from hitting multiplexes worldwide!